Always Drunk: How Did Scrapbooking Catch On and Not This? How Did Scrapbooking Catch On and Not This? It's so amazing what you can find on the Internet by randomly clicking on things. Or is it random? I've often thought that the Internet has mystical powers to rival those of the Ouija board (because I understand neither science nor magic at more than an eighth-grade level). Maybe, just maybe, our aimless surfing takes us to places we are meant to be, and shows us things we are meant to see. Not a rawhide chew toy in a jar. 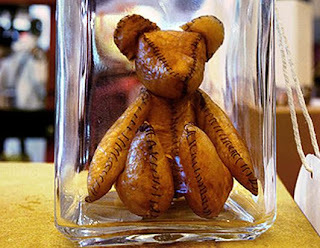 ﻿This is a do-it-yourself teddy bear, which you can make with a simple kit and...your baby's placenta. Excuse me while I clear my browser cache of the search term "placenta teddy bear kit." 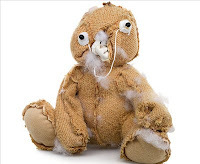 Personally, I can't think of a better craft project for a new mother than preserving and curing the sticky afterbirth expelled during labor, then cutting, folding, and stitching it into the shape of a faceless, oddly proportioned toy bear. Especially one who may be suffering from post-partum depression. Fun tip: Have Hitchcock's Psycho playing in the background; it will not only set a festive mood but may provide helpful taxidermy advice as well. I've been unable to discover what these kits sold for, or how many were actually sold. Given the product's promotional tagline of "a crafty alternative for those who don’t necessarily want to eat their baby's placenta," I can only imagine there are millions of these things in nurseries around the globe. Shockingly, it doesn't appear you can buy this kit any more, which means all of those cuddly placentabears are now collector's items. They'll probably start showing up on "Pawn Stars" pretty soon (hilarity ensues when the Old Man catches Chumlee spreading peanut butter on the shop's newest acquisition for a snack). It also means that if you want to fashion a placenta into a beloved children's toy, you'll just have to take it to Build-A-Bear like everyone else. Aww, he's got Daddy's eyes! ﻿﻿Or you can eat it. I wonder if anybody makes Placenta Helper?